Sommelier & Trainer at C.F.P.P.A. Personally I have not had much contact with the wine industry. This is not the preferred radius sommelier! 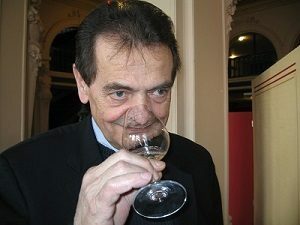 When I started sommelier, there was no training, little information, so we had a little while to discover for yourself. It was a little younger, but it is forging his own opinion without needing guru. Today, I am teaching the sommellerie CFPPA Beaune (F21200), training leading to the award of a National Diploma: The Brevet Professionnel Sommelier is the highest-level sommelier for France. Today sommeliers are fortunate to have formation where they can learn more quickly what needs to know. In France we have about thirty training Mention Complementary Sommelier and four schools for BP Sommeliers. The most important fact was learning the tasting with qualified individuals as Mr Max Léglise (a precursor of the methodology of modern tasting) and Mr Jean Sigrist of enological station Beaune. What specific traits or skills should a Sommelier (e) possess for professional performance and is there any person with those qualities you especially admire within the wine industry? Another role: to establish and manage the central cellar (reception, verification of deliveries, storage (monitoring of wines), check stock on a daily. If purchasing manager, the sommelier manages a budget that sometimes in the hundreds of thousands of dollars, it does not have too much right to make mistakes ! Inventory and daily renewal of the basement of day. With excellent presentation, kind and patient, he embodies the best brand of the institution that employs them. It must be attentive to customer needs and be imaginative and creative. Alliant Insurance, sobriety, courtesy, tact and humility he offers, without ever imposing, and manifest a commercial sense, vis-à-vis customers as suppliers. Kindness, constant availability, ease, professionalism, quality master speaking are other popular features. His presence and elegance of his actions contribute to a form of entertainment that customers appreciate. The sommelier should be seductive, accomplice, but not competent faculty to its customers. He must get to his level. It must be very attentive to the customer’s request, do not overdo it, do not recite his lesson each time, but be simple and effective. Reassure the client and feel valued in relation to its choice. The quality of oral expression is part of the rules of politeness: “Words are the dress with which a seller dresses its products.” The technical vocabulary rarely ready for this “dressing”. The book to people who can understand it. In general, a simple but correct language within the reach of a child will always be the best. Accuracy of the Board, without imposing direct, no judgment, “I am not superior to others,” other faiths sommelier. The sommelier, restaurant employee responsible for serving wine and other beverages, is primarily a service person and a seller. This succinct definition, recognized by all, is diluted too often in various applications in the art. The most important element for the customer is not his knowledge of vineyards, nor its practice of tasting or management of the cellar, nor his good enforcement or his awards and competitions won, but just that much too often forget: customer satisfaction. This man or woman is to serve the customers of the restaurant. Its mission, according to its management, is to provide a selection of the suitable wine pairing selected by the client, to serve them in the best conditions of quality, temperature and consumption rules of service. To master this global competence, the sommelier must acquire a number of know-how and skills. This knowledge will build the foundation of the culture of the sommelier and the man turn into effective and appreciated service to its customers. It builds customer loyalty and the institution. Encyclopedic knowledge and technology for the client and not for the glory and the vanity of man wine. I think a young sommelier must travel in the great vineyards of the world. Difficult to approach Burgundy without previous experience. A little bit easier for Bordeaux, because there are Bordeaux wines around the world. If possible speak at least one foreign language to their mother language. Work in fine restaurants high level, same for restaurants of large hotels often have an international style. If he remains in the area and so close to the vineyards of the country if there is. The problem differs some little. But it will be the style in the establishment where he works will determine the kind of wines that are marketed. What will orient it towards the best possible learning. It is necessary to put the client in confidence and reassurance. Difficult to give an example of an approach because each client is different. The hardest part is to determine the price range that the client is willing to invest in a bottle of wine. Do not forget that a restaurateur owner is also a trader and It is necessary to support the business. Maybe I should know the style of wine that the customer wants. Determining a region, a colour, varietal, vintage … a common light or powerful wine, or fine, a young or mature wine It will be easier to guide the client to a more precise selection …But there is no miracle recipe! My philosophy about the glasses is very simple. There are two main types of glasses for wine: good and bad glasses. In the following different sizes, shapes, is mainly a matter for crystal glassworks. After testing the various forms it was found that young wines more easily support more angular while large ripe wines arrange better with rounded shapes. Glass must be aesthetic, balanced, strong enough (for handling the restaurant), a reasonable size (storage), presentation of the table … and the price! The rules of classic agreements … At the restaurant, the choice of wines by the customer, this comes at a 5 or 6th after price, colour, name of name, origin (owner …), vintage … It is a very vast that we can not develop in a few lines area. We must taste and taste again … fairs, exhibitions, visits to wineries …Magazines are often imperfect, but they have the merit to exist. We must choose who wrote the articles in these reviews wine! Unfortunately often conditioned by the publicity and remote controlled advertisers. A Richebourg; it’s a bit the epitome of great wines, power, depth, breed, finesse, elegance and aging potential … An athlete built for distance running. Great white wines of Burgundy from the Côte de Beaune (Puligny-Montrachet, Meursault) red wines of the Côte de Nuits and Champagne.